Steve Saylor is a Toronto-based podcaster, radio host, YouTube Gamer, Graphic Designer, College Professor all while being blind! Starting in 2015, his entertaining YouTube series “Blind Gamer” fuses humour with his passion for playing video games while being very bad at it. 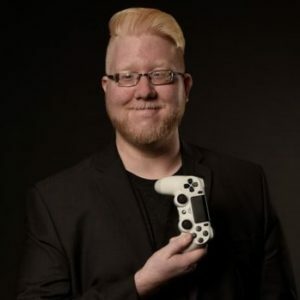 In just a few short years he is considered a thought leader on accessibility in gaming and an advocate for developers to push video game accessibility forward. Steve is the top Blind Gamer in Canada and thinks you’re awesome.